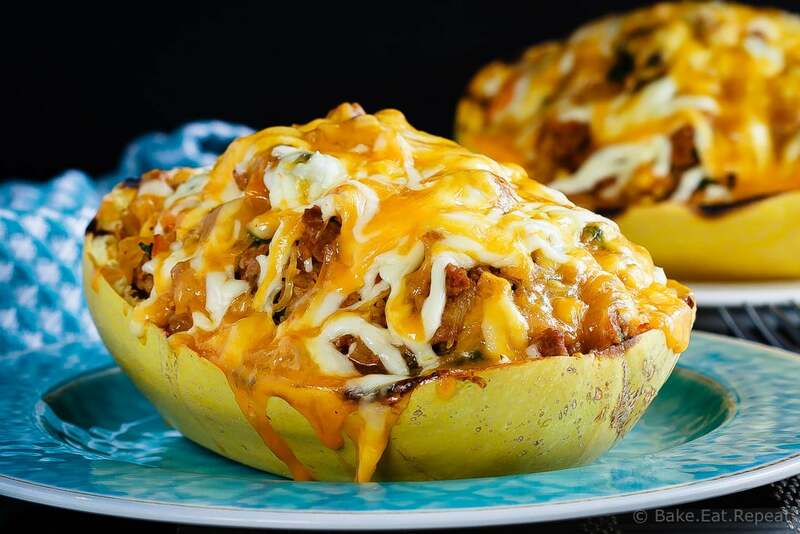 Southwest Stuffed Spaghetti Squash - Bake.Eat.Repeat. This southwest stuffed spaghetti squash is absolutely fantastic. Filled with southwest flavours and so quick and easy to make! Originally posted Oct. 27/14, updated Sept 15/16. I love Mexican flavours in my food. Whenever I’m not sure what to make for supper, my mind always goes to Mexican food. Or some version of it. This Mexican Baked Pasta is one of my family’s favourite meals of all time. Same with this Mexican One Pan Pasta. And these Fish Tacos, and these Ground Beef Tacos, and… you get the idea. Mexican food is good. We like it. 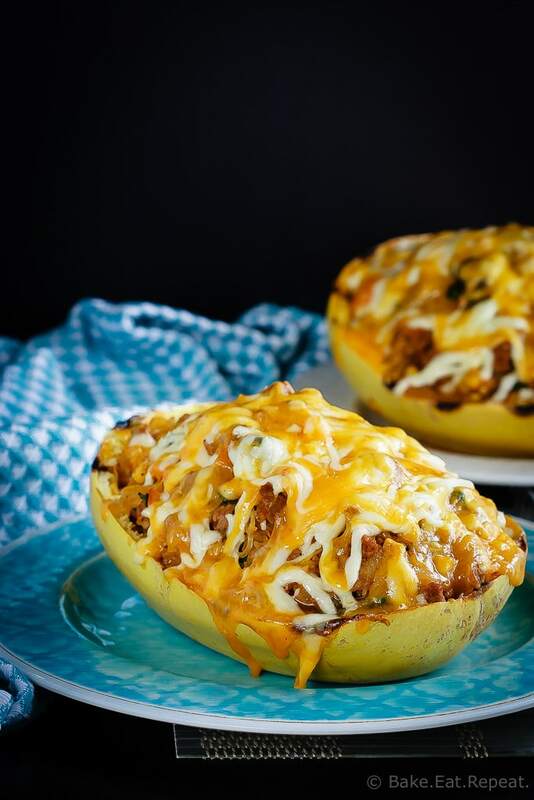 This southwest stuffed spaghetti squash is one of my favourites. I can’t say it’s a family favourite quite yet because I haven’t convinced the rest of them that squash is tasty, but I’m determined that they will all eventually love it as much as I do. Because I do the cooking around here. So they get to eat spaghetti squash. And they are starting to come around. I have been making this dish for a while now, I originally posted this almost two years ago and back then none of my kids would even try it. Well, I am thrilled to say that they all not only tried it, but liked it enough to eat their full helping. They didn’t have seconds but hey, they ate it. Progress. So if you have picky kids too, don’t give up hope that they will never eat anything. Just keep putting it on the table – eventually they will actually try it! My daughter even ate the black beans this time which has never happened before. Woohoo! Anyhow, I had actually forgotten about this stuffed spaghetti squash and how much I loved it until a friend mentioned that she makes it all the time. Immediately I had a craving for it and had to make it that week. And then I remembered how much I love it. It’s okay that the rest of the family didn’t take seconds, because that meant leftovers for lunch for me for a few days. Perfect. Outgrowing the food dislikes slowly might not be a bad thing. I don’t get the leftovers too often anymore – it was kind of nice for a change! 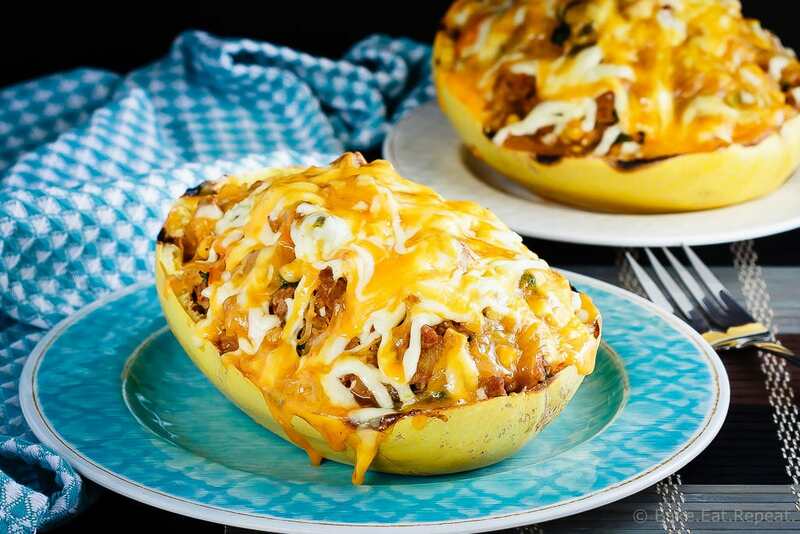 This southwest stuffed spaghetti squash is absolutely fantastic. Filled with southwest flavours and so quick and easy to make! Preheat the oven to 425 degrees F. Cut the spaghetti squash in half and scoop out the seeds. Place the two halves cut side down on a baking sheet and bake for 30-45 minutes until fork tender. You should be able to stick a fork through the skin easily. Allow to cool slightly and then scrape the flesh out with the tines of a fork, it will come out easily as spaghetti-like strands. Place the squash in a large bowl. Turn the oven temperature down to 350 degrees F.
In a large frying pan, brown the Italian sausage, breaking it up into small pieces with a spatula while cooking. Drain any grease and add the chopped onion, corn, red pepper, chili powder, cumin and coriander to the pan. Continue to cook, stirring for 2-3 minutes until the vegetables have softened. Add the black olives and spinach and cook for another 1-2 minutes to soften the spinach. Add the salsa and stir to combine. Remove from the heat. Add the meat mixture to the spaghetti squash and stir to combine everything. Scoop the mixture back into the spaghetti squash shells (or into a baking dish if you prefer), and top with the grated cheese. Place the loaded squash shells on the baking sheet and bake for 10-15 minutes until the cheese is melted. Enjoy! This is highly adaptable to your preference, feel free to sub in a different meat or vegetable. It can also be made up ahead of time and then covered and refrigerated before baking. You will need to add some time to the baking time though in order to heat everything through. Leftovers reheat well. these squash look SO yummy, I love the southwest spin! Every day?! Really?! You need to try stuffing it with all sorts of things then, you'd love it! Thanks Gigi! I have never been too crazy about spaghetti squash, but I think I would love this Southwest spin on it! It looks delicious! I still haven't tried spaghetti squash, but it looks so good and tasty! Love the stuffing, the flavours all sound amazing! Can't go wrong with mexican flavours right?! You must try spaghetti squash if you haven't though, definitely my favourite of all the squash I've had! Thanks Jess! I love spaghetti squash and I love that you stuffed it with all this yummy goodness! It looks mouthwatering and I can't wait to try this! I'm not a huge fan of squash flavour, but I love using spaghetti squash as a noodle substitute when there are lots of other flavours going on. This looks right up my alley! That melty cheese sure doesn't hurt either! Thanks Ashley! I actually love it just plain with butter and salt and pepper, but it's even better with lots of other flavours going on I think! And melty cheese never hurts! I hear ya. Why savory when you can do dessert? But this is a great recipe, Stacey! Anything with salsa and cheese wins, and this is so healthy! I really wish that spaghetti squash was easier to get in the UK. This looks so good, I love southwest flavours. Right?! It's so good, how do you not like it? Although, to be fair, I probably didn't like it much as a kid either, but come on, MY kids should like it! I am okay with the more for me part though! :) Thanks Sarah! oh my gosh! this looks mouthwatering! honestly I could probably eat the whole thing, buttt I wouldn't, I would share ;-) lol delicious! What a great way to jazz up spaghetti squash, Stacey! I've always wanted to cook with it, but just haven't gotten around to it yet. I love that you added Italian sausage and veggies in here. Sounds like the perfect dinner to me!